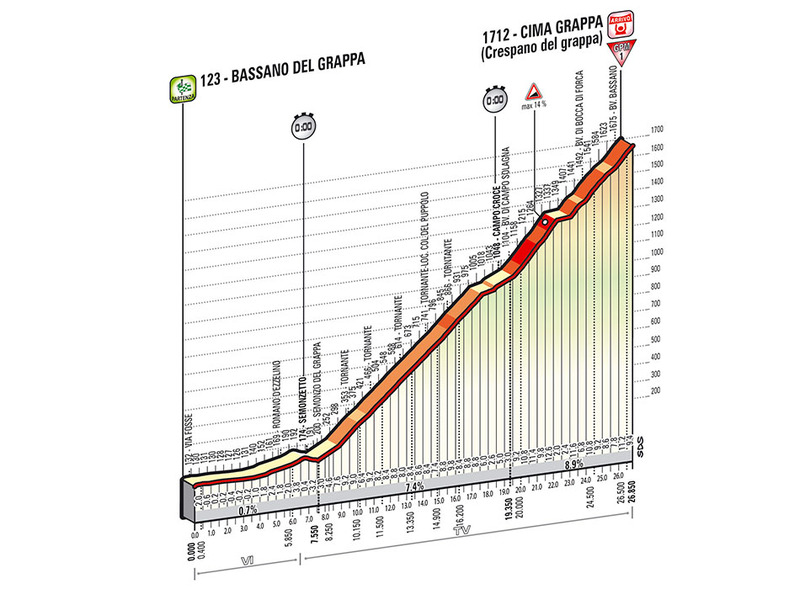 There were no surprises in the Giro’s tortuous mountain time trial, with Nairo Quintana and his magnificent shin-length pink overshoes dancing their way to the summit finish on Monte Grappa with the fastest time. With his general classification lead stretched to over three minutes, it’d take a calamitous collapse for the Colombian to lose the maglia rosa from here. Nairo Quintana (Movistar) couldn’t have dreamed up a more perfect third week time trial than this one. Unlike the sort of flat 60km TTs which we often see at the end of grand tours, this one was an excruciating 26km uphill sprint – exactly the kind of terrain Quintana loves. Riders like Ryder Hesjedal (Garmin-Sharp), who ordinarily would hope to make up time on a third week time trial, found themselves losing even more ground to the Colombian pocket rocket. That does raise some questions about the makeup of this year’s parcours, and whether it would’ve made for a better spectacle had we seen Quintana tested a little more on a flatter, longer course. Hesjedal pinched the maglia rosa from Joaquim Rodriguez (Katusha) on the final, flat time trial in 2012, and that certainly made for more riveting viewing than this one. However, Quintana certainly won’t mind – he is now just (just, he says …) a Monte Zoncolan away from winning his first ever grand tour. Everybody’s new favourite Sardinian Fabio Aru (Astana) is enjoying quite the Giro. He’s already won a mountain stage solo, and looked momentarily like picking up a second Giro victory during today’s time trial. Aru was neck-and-neck with Quintana when out on the course, only for the Colombian to really dig deep over the final couple of kilometres and pull out a 17-second advantage once the Italian had stepped off the bike. Still, Aru didn’t seem to mind. His broad grin said it all. He leapfrogged Pierre Rolland (Europcar) into third place in the GC. There’s now no doubt about it, Aru is going to be one of this season’s major breakthrough riders. Up until now he’d never recorded a major victory, though the 23-year-old has set about swiftly changing that. And it’s his time trialing ability that offers some of the greatest promise. At nearly six feet tall, Aru’s body shape is quite different to the tiny Quintana’s, possibly giving him an edge on the longer, flatter TTs. If he smooths out some of his rough edges, Aru’s going to be a serious contender for years to come. On performance in the saddle alone, today’s rider of the day would probably go to Fabio Aru. But as far as performances on the roadside go, Jos van Emden‘s (Belkin) was even more impressive. The 29-year-old pulled over to propose to his girlfriend midway through the 26km climb, and fortunately, it was worth the time loss. She said yes. Points leader: Nacer Bouhanni (FDJ). Mountains classification: Julian Arredondo (Trek). Best young rider: Nairo Quintana (Movistar). Team classification: Ag2r La Mondiale.